2010 Tresor De La Riviere Cotes Du Rhone | Wine Splash! Wine Dox Daisy gives 3 out of 4 Paws! What a nice, inexpensive wine to enjoy with your Thanksgiving feast! Or any holiday that involves good food, people, and fun! Deep garnet in color with soft ruby edges. On the nose, black cherry, earth, and spice. On the palate, medium body, velvety, with soft tannins. Flavors of black raspberry, ripe black cherry, earth, and spices. Lingering finish that consists of sweet red berry & lots of zap, zing, & zest! Easy to drink and would pair well with many foods. Mainly Oven Roasted Turkey (traditional Thanksgiving), Baked Ham, Grilled Chicken or Salmon, Thai, medium cheeses, or spicy vegetarian dishes. We tried this wine with a medium Dubliner Cheese and it paired nicely. Going to get another bottle for Thanksgiving because I am sure many in our family will enjoy it too. 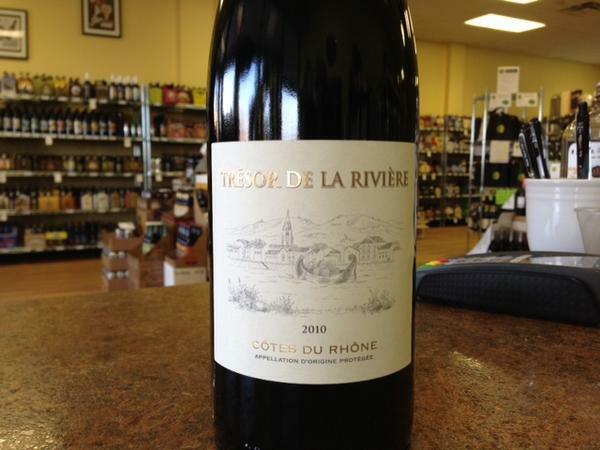 We give the 2010 Tresor De La Riviere Cotes Du Rhone red an 88 point rating. Wine Dox Daisy gives 3 out of 4 Paws for this wine! Good flavor, nice structure, and easy going enough for beginner red wine drinkers to enjoy as well as the wine educated. This is a step or two past the Beaujolais Nouveau phase and under $10 a bottle! If you want something with good flavor, ripe berry, and spice, you have just found it. WineSplashing! !